When faced with the unpleasant task of buying the right type, speed, and size of memory for a computer, most people give up and take their computer to the shop. Do-it-yourselfers often turn to online memory vendors because they’ve made the process so easy. Visit the Web site of Crucial or another online memory vendor. 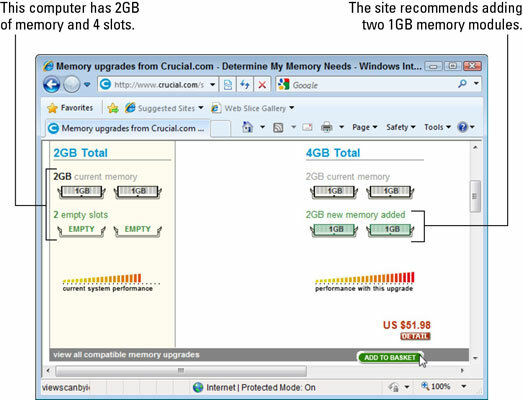 Most online memory vendors, including Crucial, offer special programs to scan your computer’s memory requirements and offer recommendations. Tell the Web site to find out what memory’s inside your computer and to recommend compatible upgrades. On Crucial, for instance, click Scan Your Computer, and choose Download the Scanner. The Web site sends a small program to your computer to scan its memory, and then presents the results. After the Web site sends you information about your computer’s memory, determine how much memory you want to buy. In this figure, the computer has four slots of memory; two slots are filled with 1GB memory modules, and two are empty. The computer currently has 2GB of memory, and the scanner recommends the computer double its memory from 2GB to 4GB, at a cost of $51.98. (Optional) Make a printout of what you’ve learned about your computer- and memory-buying strategy, and then compare prices at other sites (or local stores) before buying. Alternatively, you can simply buy the recommended memory. In Crucial, for example, you click Add to Basket to begin the purchase process.